In the summer of ’96, Benjamin Hackett has come of age, technically. And in the midst of the celebratory hangover, his world is whipped out from under his feet. His parents have finally shared their lifelong secret with him; he’s adopted. At the age of eighteen, the boy still has some growing up to do, and with the help of JJ, his loquacious consigliore and bodyguard, he embarks on an adventure that’ll put to bed a lifetime of lies. Over the course of five days, they find themselves caught up in the darker side of Cork. But when they sweep through the misfits blocking their way and finally discover the truth of it…now that’s the greatest shock of all. 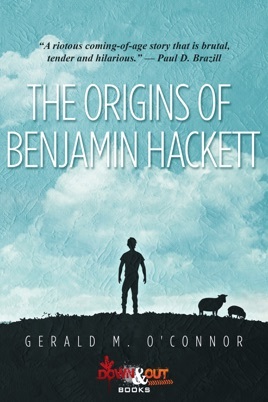 The Origins of Benjamin Hackett is a tender tale of heartache and displacement told through a wry and courageous voice. Set in Ireland, it’s a timely reminder that the world hasn’t moved on just as fast as we fancy. Now, in this emotionally charged story, Gerald O’Connor explores conditioned guilt and its consequences in a country still hiding from the sins of its past.